Ni, X., Zhang, Q., Ma, D., Wu, L. and Ren, F. 2015. Climatology and trends of tropical cyclone high wind in mainland China: 1959-2011. Journal of Geophysical Research: Atmospheres 120: 12,378-12,393. Introducing their study of the subject, Ni et al. (2015) write that Ren et al. (2006), Guo et al. (2011) and Jiang et al. (2013) had all earlier reported on "a decreasing trend in the average surface wind speed in China over the past 50 years," but they say that "few studies have focused on the trend of TCHW [tropical cyclone high wind] in China." And, therefore, they write that it was their intent to "objectively reexamine the spatial distribution of TCHW and to study its changes in the past decades over mainland China." And what did they learn by so doing? The five Chinese researchers report that they found (1) a significant downward trend in the annual TCHW frequency during the period from 1959 to 2011 in mainland China (see figure below). And they say that (2) the TCHW intensity also displayed a downward trend, with (3) a higher rate of decrease at high percentiles. Still further analyses revealed (4) a reduction in the range of TCs' influence from 1959 to 2011, as well as the fact that (5) the annual number of ITCs (TCs that cause at least one TCHW event) "declined consistently during the study period." Figure 1. 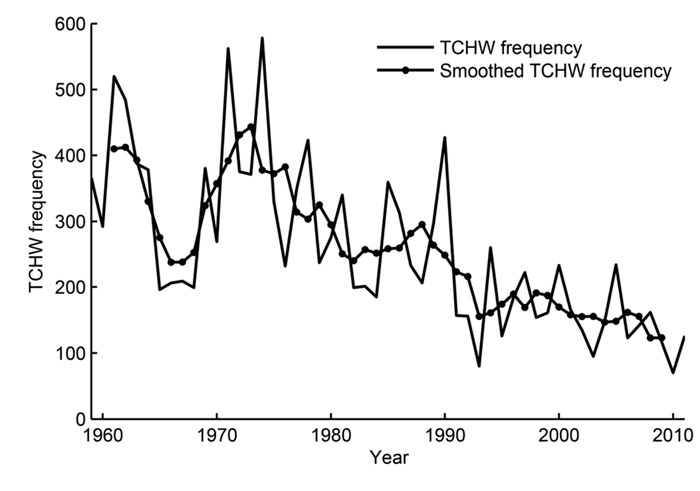 Annual TCHW frequency and 5 year moving-average from 1959 to 2011. Source: Ni et al. (2015). And thus we have another example of a dangerous meteorological phenomenon actually declining in frequency, intensity, aerial coverage and negative consequences over a period of time when the world's climate alarmists have vociferously claimed that Earth's climate was becoming ever more dangerous to both humanity and nature alike. Guo, H., Xu, M. and Hu, Q. 2011. Changes in near-surface wind speed n China: 1969-2005. International Journal of Climatology 31: 349-358. Jiang, Y., Luo, Y. and Zhao, Z. 2013. Maximum wind speed changes over China. Acta Meteorologica Sinica 27: 63-74. Ren, F., Wu, G., Dong, W., Wang, X., Wang, Y., Ai, W. and Li, W. 2006. Changes in tropical cyclone precipitation over China. Geophysical Research Letters 33: 10.1029/2006GL027951.